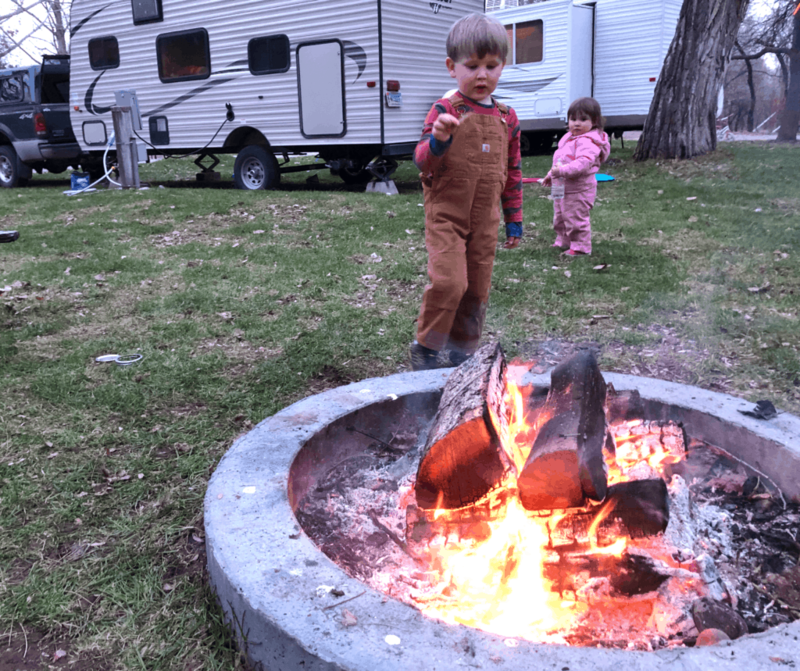 Starting a campfire is probably one of the highlights of each camp trip – that wood smell, the smoke curling up into the sky, the crackling, and of course all the yummies that come with cooking over it! But you know what is REALLY frustrating? That whole time BEFORE the fire starts, when you’re out of breath from blowing on your campfire, or you’ve used up all your kindling so now you’re ripping pages out of magazines! I’m not going to lie – I’m pretty bad at starting campfires. I did get a lot of good practice this winter since we use a wood stove, and my husband traveled a bit more than normal which left me with the responsibility of starting that morning fire. HOWEVER, starting a fire in a controlled place like a stove, where it’s always dry and you can control the amount of wind and such is way different than starting a campfire outside! After all those fire making attempts it got me thinking.. how many ways are there to start a fire? What if we didn’t have access to pinecones (what we used for our firestarters) what would be the next best thing? Well, don’t worry – I bet there’s something in this list that you can do! Pet hair, makeup pads, cotton balls, road flares (LOL!) people get pretty creative with their fire starting methods! After all, who doesn’t love a roaring campfire at the end of the night! Fun Ideas for DIY fire starters at home! 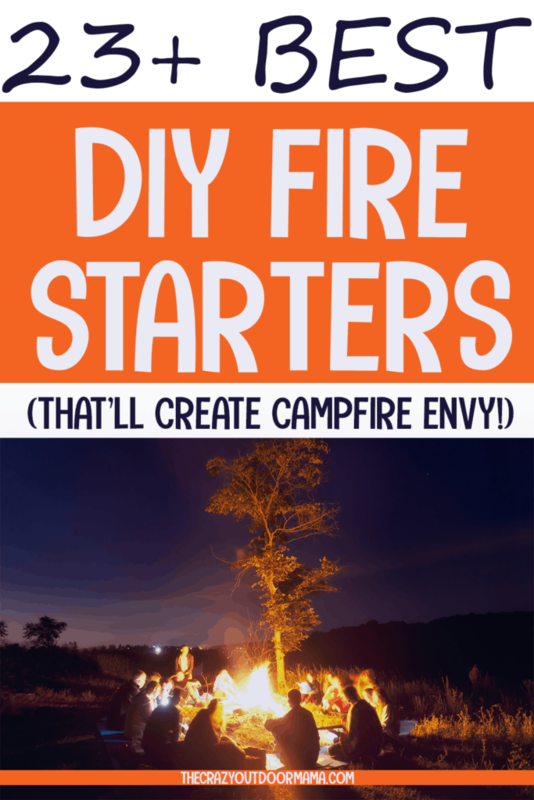 Want to still make an awesome campfire using fire starters, but don’t have time to DIY? Then BUY! Do you have a personal favorite homemade fire starter? 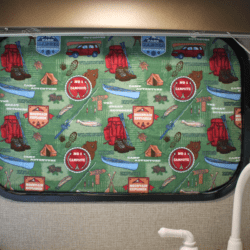 Help a camper out and leave it in the comments! 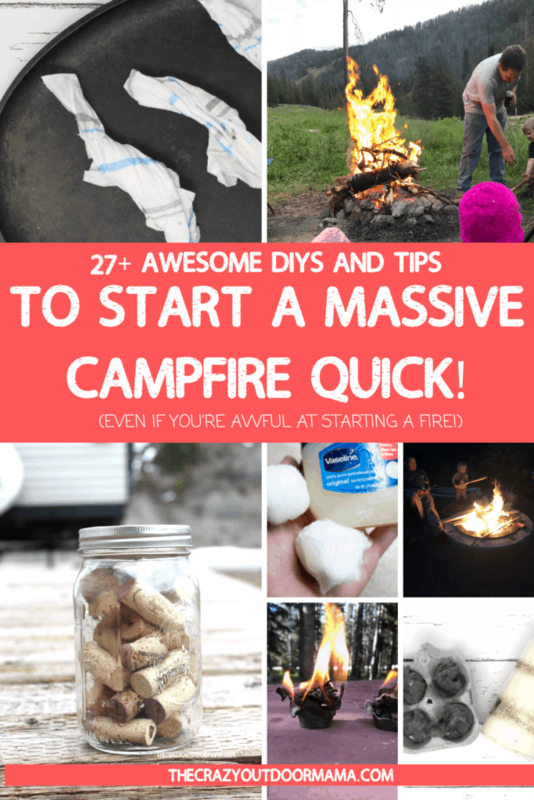 So, JUST in case you’re here and have never started a campfire before, we’ll go over some super basic stuff just so you have an idea of what you’ll need to do! 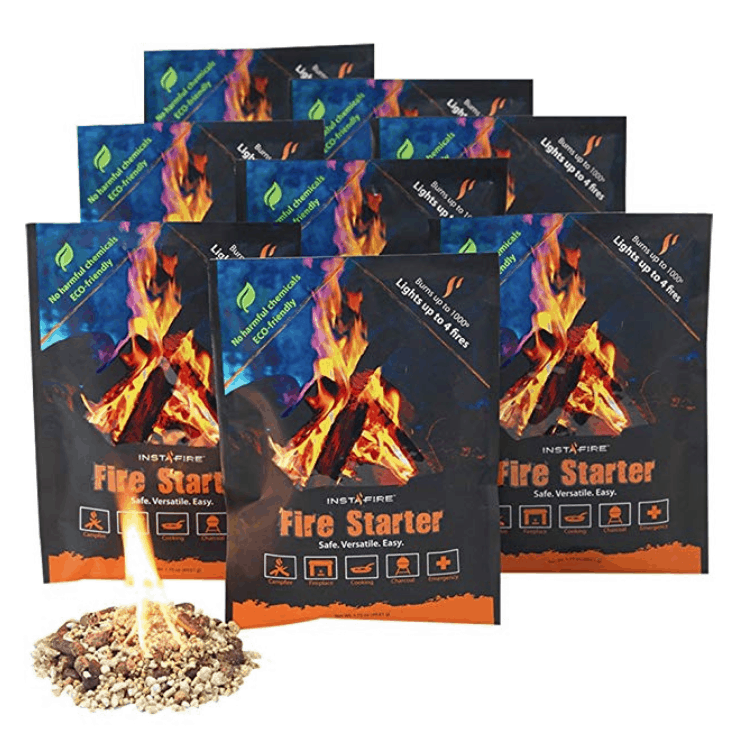 Many people build campfires without needing any extra fire starters, however, if the wood is wet or you have limited kindling, those fire starters do come in handy. Kindling – Small sticks no thicker than a pencil, or kindling you create yourself by splitting up a big log into much smaller pieces! Lighter – You probably know this, but thought I’d put it here! Log Cabin – Make a kindling teepee over your tinder (super duper small stuff, or your firestarter) then put two logs on either side of the teepee. Make a square by adding two more logs to the other side, and build it up into a “cabin”. For more firepower, add a “roof” by laying some kindling over the top! Teepee – Build a teepee of kindling around our tinder, then put an additional layer of bigger firewood around that! Light the inside and watch it go! Lean to – Put a larger piece of wood on the ground, then lay all your kindling on top of it at an angle. Put your tinder underneath it all! Make sure that you make your campfire only in established fire rings! 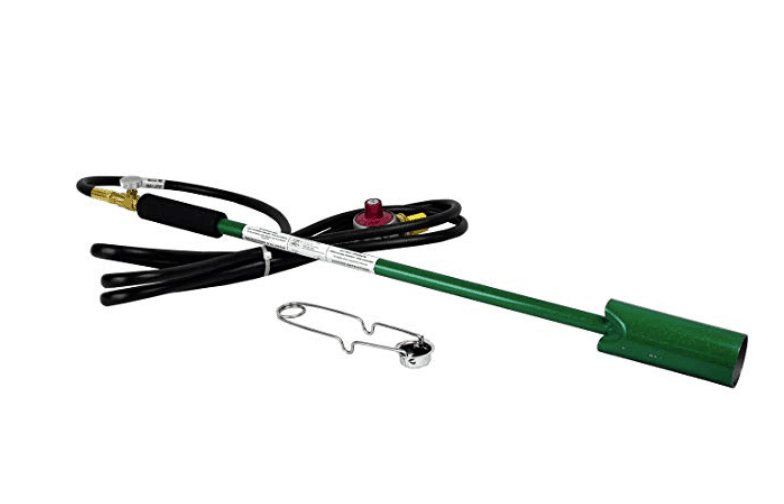 If you don’t have one, dig a shallow hole, surround it with rocks to (help contain the fire) and place it well away from your camp to avoid embers landing in your campsite. I found a really amazing guide that is a step by step to build a campfire here if you want more information to get the basics down! As you can imagine, there are plenty of things to buy to make your fire starting efforts WAY easier, but I wanted to go over the crazy amount of ways you can make them at home first! These are probably some of the easiest because EVERYONE has dryer lint, and of course… it’s free! An easy way to remember to collect your dryer lint is to hang a bag on your doorknob or some other convenient place so that you can put it in there after each load! I love this option because cardboard egg cartons stack so easy! Just put dryer lint in each “cup” of the egg carton, and drizzle melted wax on top. Tear off when ready to use! People really like putting their fire starter in a can, and a tuna can seems to be most popular! 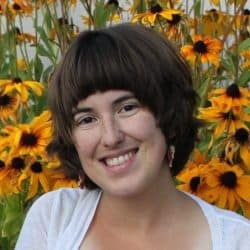 Most people have these items around their home or they can be purchased or fairly cheap at places like the dollar store (or my personal favorite… the thrift store! Some of these require melting things like wax or vaseline, so just wanted to give a quick tutorial on how to do that. 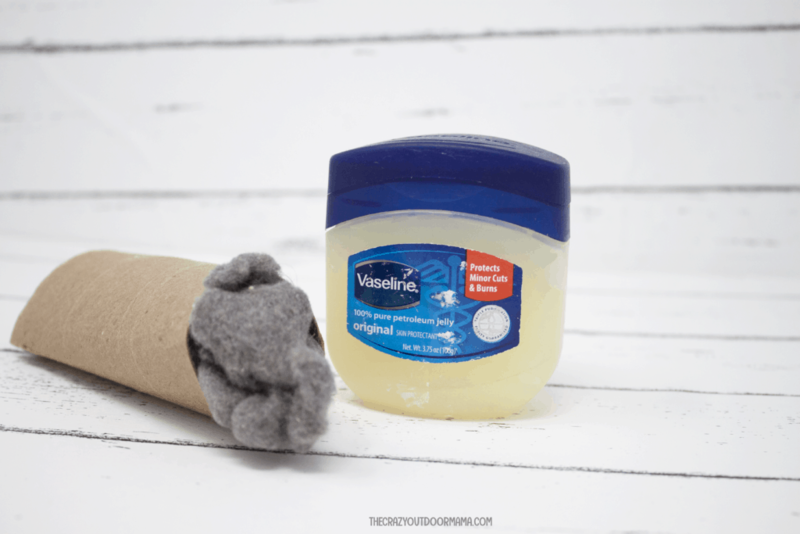 Get a shallow pan of water to boil, then place the wax or vaseline in a can and set it in the pan. It’s a good way to get indirect heat! Some people also use a crockpot, but if you don’t have a liner of sorts, that could end up being really messy! Anyways, here are some sweet ideas to make fire starters at home with almost anything! These are really good for space saving and just being plan simple! 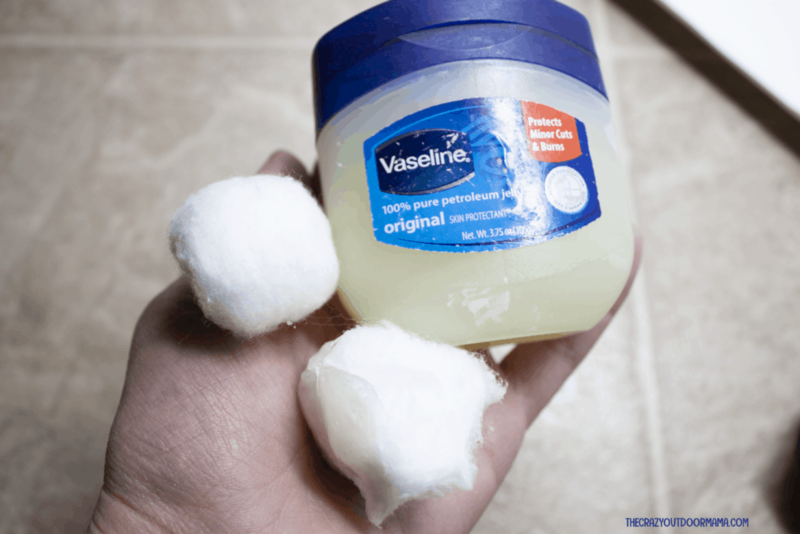 Many backpackers use this style of fire starter since it’s so easy to store -just melt the vaseline, pour it over some cotton balls, and once cooled put them in a little sandwich bag! 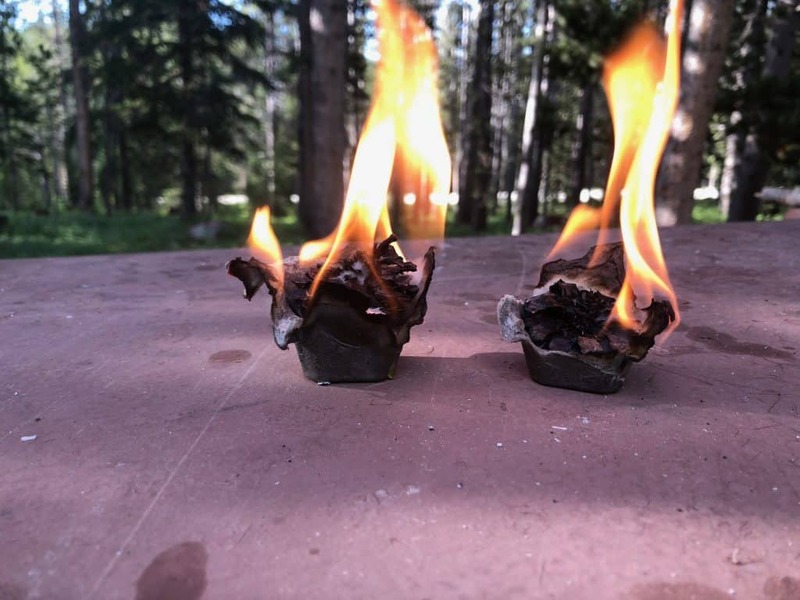 These DIY fires tarters are super easy to stuff into a sandwich bag if you’re low on space next time you go camping! Corncobs are good on their own, but soak them in kerosene? FIRE POWER!! As always, be careful using the kerosense! 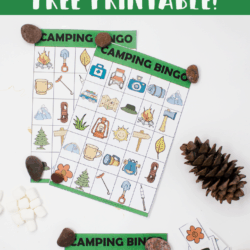 These are fun to make with the kids, store easy, and if you camp near pines, you can probably find everything you need! Check out the tutorial here! Ever realize how oily chips are once you look at your fingers after and they’re shiny? Well, use that oil to your advantage and chuck a couple under your kindling to help start your fire! ANYWAYS – save those paper towels you use from wiping up the mornings pans, and put them in a baggy for some good fires later on! Who doesn’t love a fire starter that smells like bacon in the morning?? 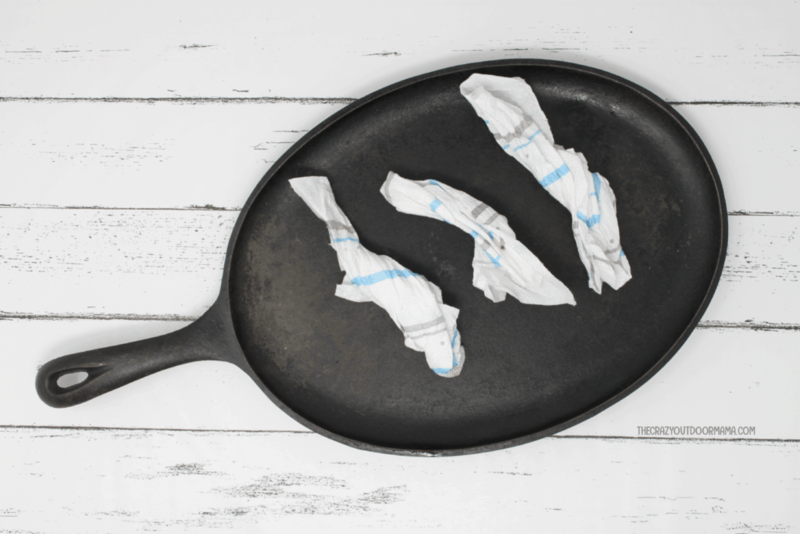 Clean up your cast iron after your next camp breakfast AND make the next fire even easier with grease soaked paper towels! Ge a bunch of newspaper wet, roll it up, and once dry, bring it with you in a small bin! It’s like newspaper fire logs! I love these because they will store super easy (think widemouth mason jars or small peanut butter containers) and the fact that candles are pretty easy to find at a thrift store! Melt, dip, and store for when you’re ready! If you don’t mind the smell and forget to gather your dryer lint, dog hair can be an easy alternative, especially for spring when dogs are losing their winter coat! While I prefer to save my wines (and let’s be honest, these days my life consists of box wine as opposed to bottled… it’s cheaper and still tastes good!) some people figure they ought to make them useful and turn them into fire starters! Store them in a small mason jar so they stay moist! 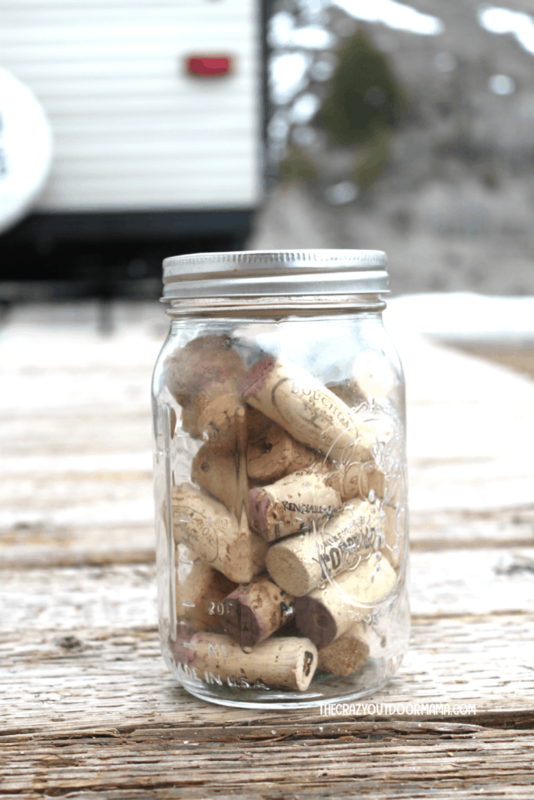 Save your wine corks, soak em, and put them in a mason jar – it’ll look pretty and be functional! This one is even easier than the wax because there is no melting involved, and baby oil tends to be pretty cheap! 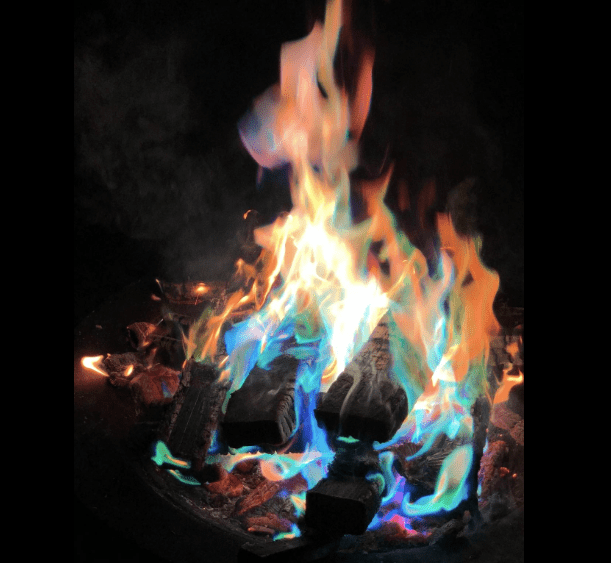 This is a great fire starter to make if you know (or are) a woodworker! Melt some wax in a crockpot, add wood shavings and sawdust, then pour it into a cupcake sheet (make sure you use liners) with a string dipped in wax inserted in the “cupcake” once it’s poured! Unsurprisingly, hand sanitizer is a great fire starter! So just put it on something like a paper towel and it’s ready to go! You might already be familiar with this oil – it’s used to keep mosquitos away, and usually used in things like tiki torches. However, spread some of the citronella oil on your kindling and not only will you have a good fire, but it will help keep the mosquitos away too! Unless you dutch oven cook at camp (if you haven’t yet, you gotta try it!) you probably haven’t realized the full potential of how long these guys can burn, and how consistent the heat is! So if you have any pieces of charcoal that aren’t completely used up, put them under your fire structure to really help our your campfire efforts! If you’re near a pine forest area, try checking out some dead pine trees that died naturally to see if you can find this pretty awesome natural fire starter! I included a video for those who are curious – I know I was, I had only heard it mentioned before and never knew! And I should, there’s tons of pine around me! As you can imagine, when there’s a problem, people create solutions… and sell them! These are some of the most highly recommended fire starters out there that are perfect to bring camping! Burns for up to 15 minutes! Burns anywhere – it’s naturally insulated, so is perfect for dewey mornings camping to get the fire started with your damp kindling and wood! No stinky chemicals – This one utilizes recycled wood, volcanic rock, and food grade paraffin wax. Safe to store and easy to pack – This is non volatile, so is a safe thing to store every time you hike or camp anywhere! 30 year shelf life too! Burns for up to 24 minutes straight – This gives plenty of time for your campfire to catch! Wrapped and easy to pack – I’m a fan of small and mess free, and these fire starters are both! 100% natural, no additives – perfect for those trying to be as green as possible! Salve Wood and Fiber SCS Verified – This means that this wood was responsibly recovered, and adheres with social and environmental standards! You only need a very little bit to start a fire, so this box will last a looooong time! Alright, I couldn’t NOT include a blow torch of some kind! While I prefer to carefully build a fire, my husband loves to skip everything and just torch it whenever possible! Apparently I’m not alone, as many people like skipping the tinder, kindling and fire set up and just use a blow torch! I have linked a pretty powerful one that was recommended, however here is a smaller blow torch version for those who don’t need as much firepower! Generates heat up to 2,000 degrees F! Simple to use – just throw a pouch in the fire! Creates 20 minutes of pretty, changing colors! There are so many fun ways to start a fire – it’s often a competition between my husband and I should we have trouble getting one going!